Used only for 6 months, in excellent condition, (brand new retails for in excess of $6,000.00). The TheraFlo is a portable mattress replacement system with low air loss designed to treat and prevent bedsores. It is designed to replace a standard mattress and fit most homecare or hospital beds. 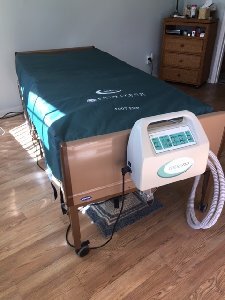 The TheraFlo consists of a power unit, a mattress replacement, (80" x 36" x 10") and a cover. The power unit utilizes a blower to provide energy efficient air flow for patients up to 1,000 lbs. It is equipped with a Max Inflate mode that quickly inflates and firms the air cells of the mattress to allow easier patient transfers on/off the mattress and facilitate other nursing procedures. The mattress replacement consists of twenty air cells over a 2” convoluted foam base. The air cells are ventilated to provide low air loss, which aids moisture management. The high quality cover is made of quilted nylon taffeta. It is both waterproof and moisture vapor permeable, which helps wick moisture away from the patient’s skin.